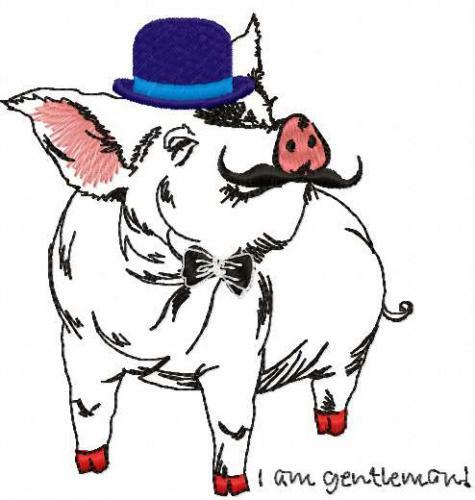 Showing results for tags 'mustache'. This is original and stylish terry towel made by Kaaren Reed. It definitely belongs to man. It is clear because of its moderate design in calm color scheme and interesting embroidery sample. It is Root man embroidery design. This is portrait of fantastic old man with beard consists of roots of giant trees. His hat is covered by grass, leaves, flowers and mushrooms. They are made in more soft colors than on original picture. This is original project made by Lyubov1401 for lovers of embroidery without fabric - FSL. 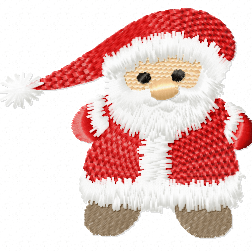 Yes, this is not very simple Santa's embroidery. 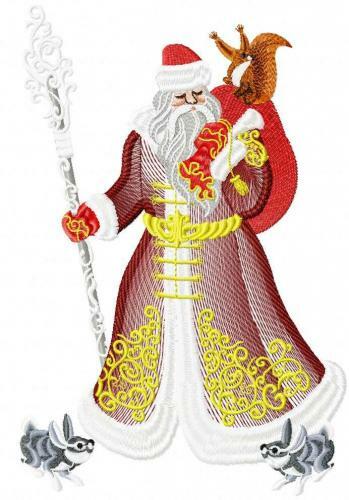 But if you are ready to learn and master new technologies, Santa Claus Hardanger free embroidery design is for you. With your creative abilities you will amaze everyone who sees this realized project. It will be a great Christmas table decoration. Its size is 4.17 x 5.91'. This is embroidered Christmas sock decorated with fluffy fur border. 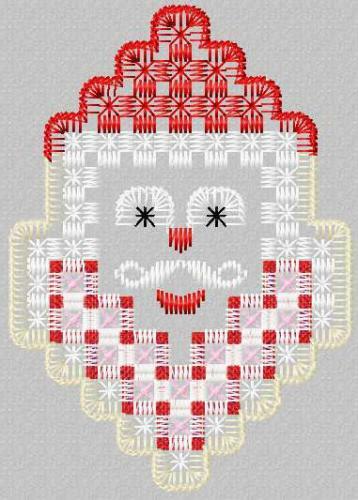 Its top is added by embroidered picture of main hero of Christmas — Santa Claus. 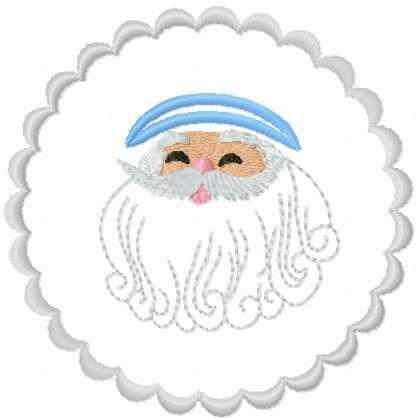 Santa Claus photo stitch free embroidery design by Pete Creffield is the portrait of magic granddad with all his specific features including red cap, white beard and mustache and the blush in his cheeks. Santa Claus is depicted with a little bird in a striped cap: they are ready to meet Christmas. This picture shows the set of original souvenirs which can give the special charm for your New Year or Christmas party. There are six similar fabric circles which are decorated with the face of Santa Claus. But is just the part of the final look: its important detail is the bright red napkin. It creates the costume and cap for Santa. So the color scheme of this serving items is based on traditional Christmas colors — red, golden and white. 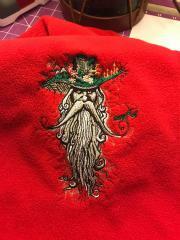 On this picture you may see the funny embroidery sample on the bright red background of fleece fabric. 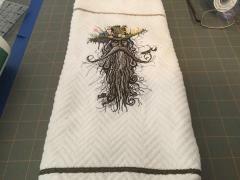 Root Man embroidery design is the portrait of fantastic character which seems to be looking right at you. It is the face of old man with long beard of tree’s roots. He is wearing the hat with many flowers, plants and mushrooms on its surface. The green color of the hat makes the interesting contrast with intensive red color of fabric.